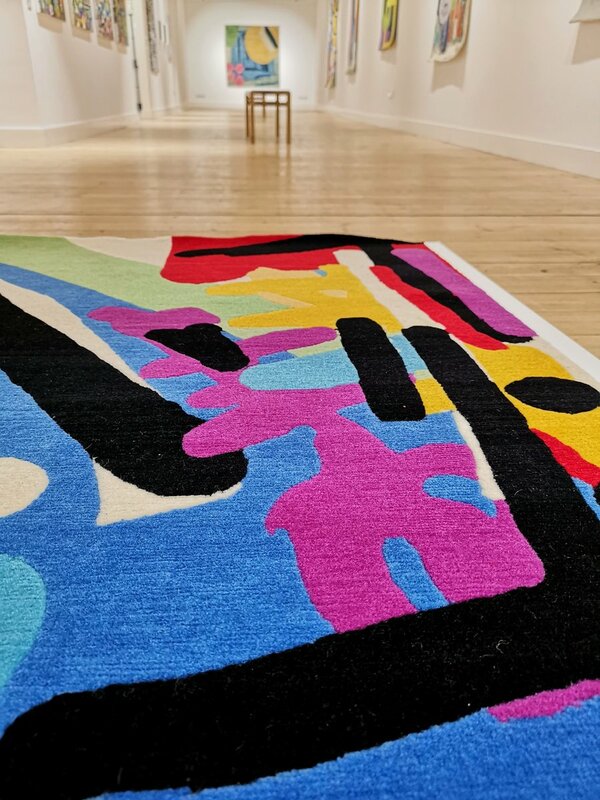 To celebrate Allistair Covell’s first ever solo exhibition Canvas To Carpet here at Broadway Gallery, we are launching an exciting competition entitled “Design Your Own Rug” in partnership with Digswell Arts Trust and Rug Maker. Taking inspiration from Allistair's abstract and colourful paintings and hand-knotted carpet designs, we are inviting our visitors to create their very own canvas to be transformed into a carpet! The winning design will be made into a 1 m x 1 m square rug and hand-woven by Rug Maker's weavers in Nepal. The rug will be placed on public display at Letchworth's new tourist information destination, Discover Letchworth which opens this June, before being awarded to the winning designer. To enter the competition, you will need to complete the fields below and submit your rug design either by uploading it via the button found here or alternatively deliver your design in person or post to The Broadway Studio & Gallery, 2 The Arcade, Letchworth SG6 3EW. Please kindly ensure that your name and contact details are clearly marked and remember competition closes on Sunday 5th May 2019! 6. Sign up to receive special offers, competitions and event news from ALL Broadway venues. *This question is required. The Broadway Studio & Gallery, part of the Letchworth Garden City Heritage Foundation, will store your information securely in our data systems. We will use the email you have supplied to contact you with the results of the competition after the closing date of Sunday 5th May 2019. Once the competition has concluded we will remove the contact information from our systems. Thank you for providing your postcode - we will anonymise and group the postcode data so that we can analyse where our applicants are coming from. You can withdraw your consent for us to store and use your data at any time between now and the closing date of the competition by contacting the Broadway Studio & Gallery, 2 The Arcade, Letchworth Garden City, SG6 3EW or on 01462 476110 or by emailing broadway@letchworth.com.